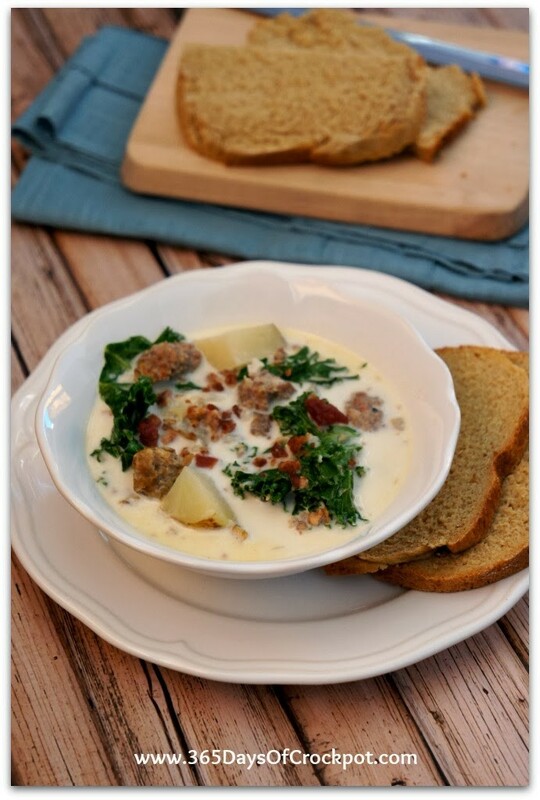 An easy slow cooker recipe for the Olive Garden favorite–Zuppa Toscana. 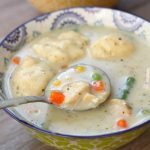 It tastes better than the restaurant and is really fast and easy to make. Don’t you just love soup in the winter? It is one of the few redeeming things about winter, in my opinion. Because at this point I think we can all agree winter isn’t just that magical anymore! The snow in my backyard is crusty, my car is beyond dirty and my pasty skin could use a little sun 🙂 But back to soup…it’s awesome. 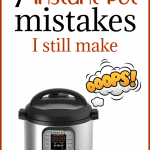 I especially love making it in the slow cooker to let it simmer all day and bring wonderful smells into my kitchen. This soup is a copy cat of the Olive Garden favorite. But I really believe this soup was better than the restaurant! 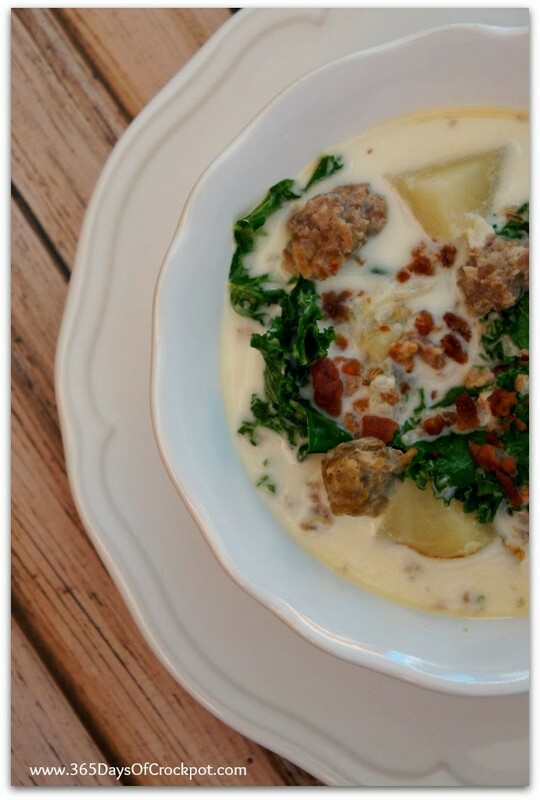 It has tons of flavor from the sausage and bacon and I love the slight crispness from the kale. My kids and husband and I had this downed in just a few minutes the other day. If you’re serving a crowd, make sure to double it!! 1. In a pan, over medium high heat brown the ground sausage until well done. Drain off all grease and place sausage in a colander. Rinse the sausage with very hot water to get as much grease off as possible. Add the rinsed sausage to the slow cooker. 2. Add broth, water, onion, potatoes and garlic to the slow cooker. 3. Cover and cook on LOW for about 6 hours, or until potatoes are tender. You can also cook on HIGH for about 3-4 hours. 4. Stir in 1/3 cup bacon bits. Warm the cream and then add it to the slow cooker (to prevent curdling make sure it’s warm). 5. Cut up kale into coarse pieces* (I liked my pieces kind of large and chunky but if you like them more indiscernible cut them small) and add to the slow cooker. 6. Ladle into serving bowls and top with extra bacon bits and Parmesan cheese. *I lay a piece of kale on a cutting board and then cut off the leaf portion and discard the rib and stem. It’s kind of time consuming but the stem is bitter and tough…you won’t want to eat it. yum that sounds good. What recipe do you use for garlic bread sticks? I use the olive garden breadsticks recipe. I used shredded chicken seasoned with garlic,Italian seasoning and fresh garlic, used spinach instead of kale and used the broth from cooked chicken. Topped with homemade garlic parmesan croutons and just a pinch of shredded cheese. It was amazing! yum to the homemade parmesan croutons! Yum, I bet that will be good! So you add yhe kale, bacon & cream after its done cooking? Yes, after it's done cooking! Do you have any suggestions for a chicken or veggie alternate to the sausage? My husband won't eat pork or beef (lame) so I was trying to think of something else that wouldn't be gross!?! I would use ground chicken and season it! Just the ground kind works best. I must be sausage- dumb. Do you mean the ground crumbled kind, or the link kind? Delicious! I used whole milk instead of cream and it was fabulous. 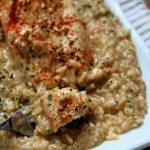 I know I am SUPER late to this party, but I made this recipe a couple nights ago, and it was AMAZING! Just as good as Olive Garden! Do you think it would work just as well if I used evaporated milk? 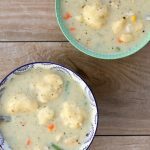 I hate the idea of all the calories and fat in heavy cream – although I'm sure it tastes wonderful. I also like the idea of using spinach instead of kale. I don't think I could sneak kale past my husband, but he likes spinach. 1 cup of water, chopped??? 2 cans of chicken broth: What size cans? 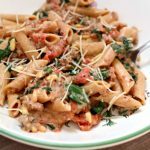 We had this for dinner tonight, and it was a hit! Thank you! I was hoping to find a crockpot version of this. Can't wait to try it! Does this work on the low setting for 2x the time? I may have to try it, but am away from home longer than 4 hours during the day. This was just as good, if not better than the Olive Garden version. I doubled my recipe/ingredients, and use one package of hot and one package of mild sausage to mix it up. I also omitted the bacon bits in mine. This was great and so easy! I can't wait to make it again. Thanks for posting this. Just a tip on Kale, it is easy to grow and winters over. I've had my Kale in my garden boxes in Utah and they are going into their 3rd winter! Our chickens love it too. They always line up at the fence when I'm bringing the kale to them. It is a great producer. Made this tonight with homemade turkey sausage (from another online recipe), dried mushrooms (that I soaked and added the water to the mix for added flavor), and turkey bacon diced up. 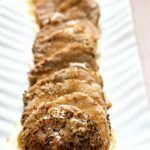 It is a VERY good recipe for a slow cooker and to freeze as well. I went out and bought all the ingredients today. Can't wait to make this tomorrow! Is that supposed to be 1/2 cup bacon bits? This sounds amazing, I can't wait to try it!!! i make this all the time but w/o the mushrooms .